TALK ABOUT YOUR RACE. 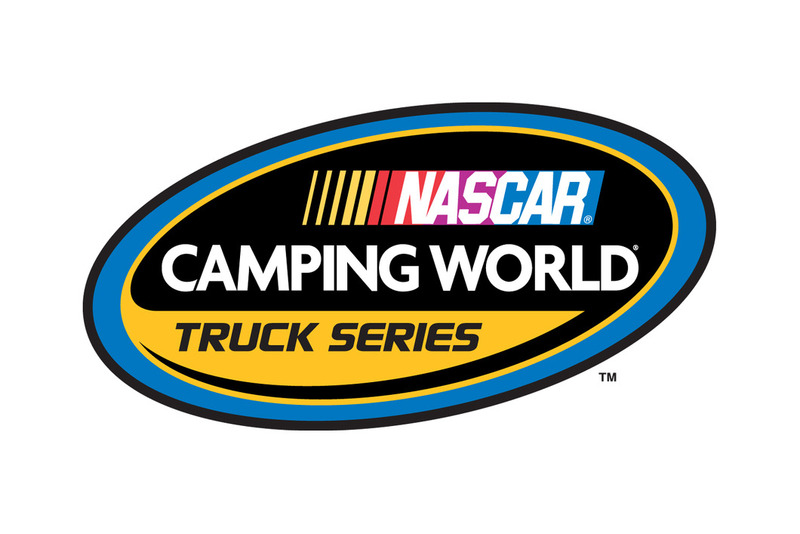 "The truck was really good on restarts. We worked three years on our program with Roush and our gearbox people to get those restarts where the gearing is right, in the proper gear at the proper pit road speed. That plays a lot in getting the rear tires cleaned off so you can get good grip leaving. I was a little better than Jack on the restarts. The last two, he was right there with me a little, so I wasn't as good. I'll tell you, the Eldon Ford ran great today. The guys at the shop built me a great truck and the engine was flawless. Sprague ran tough all day. I put a lot of pressure on him and couldn't move him and he did the same to me, putting pressure on me. I was sweating it the last 20 laps. He had a really good truck, and I was a little nervous about those guys stopping for tires and whether they could get us. It was just good pit stops and a great truck and we were able to hold on for a win today. It's kinda exciting because this is my first win out here in Phoenix, so I was excited." YOU MADE IT TO THE FRONT RATHER QUICKLY FROM YOUR 11TH-PLACE STARTING POSITION. "We were running pretty good on the race track. We were able to get from 11th to fourth before pit stops even started. We made a pretty good chassis adjustment and came out in the same position on the first stop. The last time, we picked up a spot and came out second, so that was a good job for the guys. They work really hard on pit stops and they're really proud of that. The crew gets praised for good pit stops. When you come in fourth and go out fourth, that's an accomplishment, that's a big accomplishment. To come in and make a chassis adjustment, we lowered the track bar and changed the air pressure, and we still came out in the same spot I came in. And when we didn't adjust on the truck, I gained a spot. It was certainly a great job in the pits today. We thought about coming in on the last caution, but I thought it's so hard to pass here. Track position is key and I figured there would be a few more cautions because the guys that came in for tires and they'd be back there racing for spots. I was in OK shape as long as everyone didn't come in behind me. A few guys stayed out and that helped us." DID YOU LEARN SOMETHING FOR TOMORROW? "I've been saying that my Busch car is a little bit better than my truck. 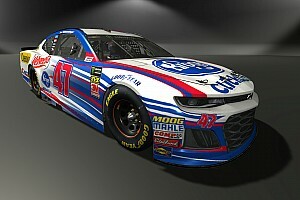 I'm a little happier with the Busch car than I was with the truck, so hopefully that's some exciting new for me for tomorrow. 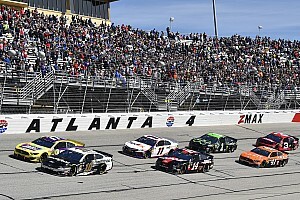 I definitely learned what the race track is going to be like and what it's going to do throughout the race and what kind of adjustments I think I'll need to make. I'm pretty confident for tomorrow. I can see where Harvick has gained some momentum running both series most of the year. Qualifying the truck and then qualifying the truck certainly helped me. I qualified up front in the Busch car and I learned something when I qualified 11th in the truck, so I applied that over there. It's just that extra practice on this race track, or anywhere, is going to make driver better." YOU HELD OFF SPRAGUE ON THE RESTARTS. "I was worried. I don't think that Jack could stay with me on the first lap, but I was afraid he was going to put pressure on me on the second lap. For some reason, when the tires cooled off, the thing turned better, but it was worse in terms of front traction. I was really struggling in 3 and 4 trying to get momentum up off the corner. Jack was pretty good down there, so I was worried about him getting close enough underneath my wing to loosen me up some more. And, that's about all it would have taken to get up beside me and make a pass. When that lapped truck spun, I had quite a bit of distance on Sprague, so it was unfortunate to see that caution come out with 11 to go. I didn't want to see that one, but the other two to end the race, I didn't mind. You hate to give the guys behind you opportunities to pass you, and I felt that we'd be OK."
WHAT ARE THE DIFFERENCES BETWEEN THE CARS AND TRUCKS? ""It feels like the Busch car had more power. They're pretty equal on power. The engines are technically identical, but the Busch car has less drag so it accelerates better and faster because it's not being held back so much by aerodynamics. The Busch car has a lot more downforce, both front and back. You can feel it dig into the race track a little better. It's a little crisper turning where the truck is more up on top of the race track. It slides around a little bit more and you can't go around the corner as fast. Those are typically the characteristics that you feel. It has a little more acceleration and the Busch car sticks into the race track a little better with the aerodynamics. Plus, it's seven inches shorter in wheelbase, so that makes a tremendous difference when you're going around the circle and the thing is seven inches shorter. It's a lot more responsive." YOU DIDN'T RUN AWAY WITH THIS RACE LIKE THE ONE IN NAZARETH. "I was thinking about that with 20 to go when Sprague would gain on me and I would pull out a little. 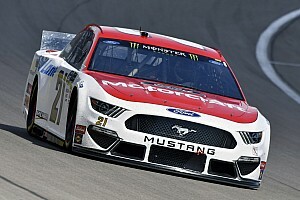 One of the reporters asked me if I would rather win by a little or a lot, and I said that it's always fun when you race somebody when you have a faster car or truck an you win, but today, I sure would have liked to have been out there 12 truck lengths because I was nervous with 20 laps to go."